Here’s a free lesson from Fiddling Demystified Vol. I. I teach the Irish tune Swallowtail Jig. 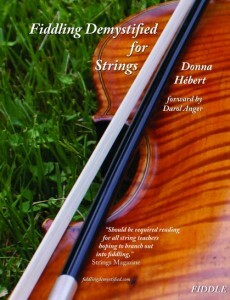 Basic and fully-styled Irish settings are included for G clef (violin/fiddle/flute) with the tune played slow and fast. The CD also includes a lesson track. The rhythm and bowing lesson for this tune teaches both slurring into the downbeat and starting phrases on an upbow. Try it for that lovely, light, jiggy sound. For the left hand, there’s a lesson on playing a jig roll, flicks and note-bending smears. If you listen for the subtleties of dynamics, you’ll hear them – and they are part of the overall rhythm of the tune.